How to prevent key figures getting repeated in Opportunity reports .? 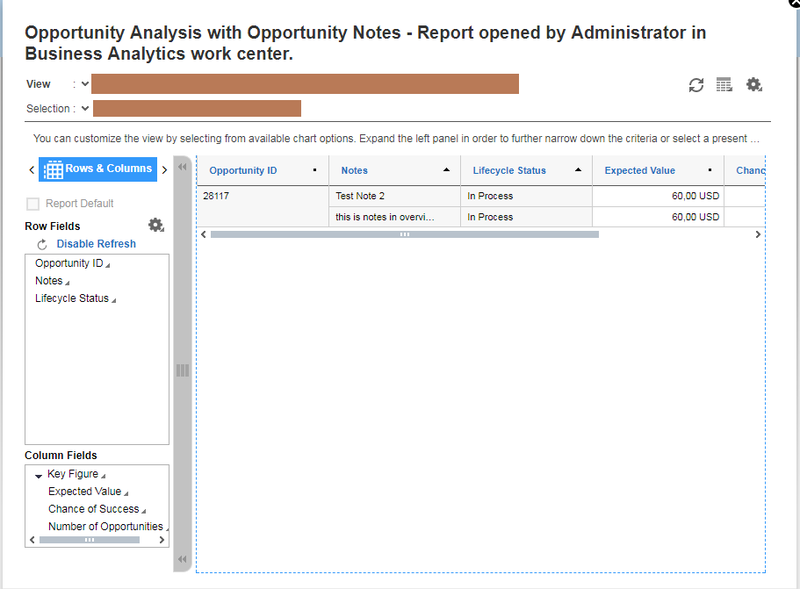 I have created a report in SAP C4C, and I want all the 'notes' of opportunity in a single cell, so that all the characteristics & key figures next to 'notes' are not getting repeated. Currently all the characteristics & key figures next to 'notes' are getting repeated, and worst part is repeated key figures (values) are getting added when subtotal is enabled. -->>Is there any way to send 'Notes' to end of table ..?? -->> How to prevent all the characteristics & key figures next to 'Notes' getting repeated ..?? I have attached 2 screenshots; in that, "screen1.png": opportunity having multiple notes is shown. "screen2.png" : when subtotal is enabled. It seems your report is running on Data source Opportunity Item. Just try to run on Opportunity Header [CODOPPH]. You can Enable complete notes at report level by enabling Extended test as follows.